Tech basketball cannot survive without Jose Alvarado. 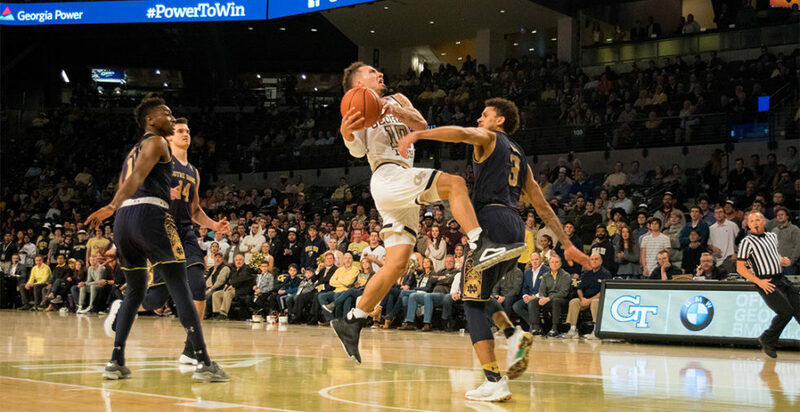 Saturday’s game was a sobering reminder of that fact, as the Jackets managed a miserable 51 points against a mediocre Louisville defense with the noticeable absence of Alvarado from Tech’s lineup. Alvarado, resigned to the bench following a groin injury sustained against Clemson the week prior, could only watch as Tech shot a miserable 38 percent from the field. James Banks III shouldered the load as best he could, racking up an impressive 24 point, 11 rebound, 3 block performance in 37 minutes on the floor, but no other Tech player reached double digits in Tech’s worst offensive showing of the season. Alvarado is lightning in a bottle for the Jackets — the undersized guard has the speed and basketball IQ to create plays on the court for Tech. Alvarado leads the Jackets in points per game, assists per game and steals per game. Alvarado’s stat-line is not only a tribute to his ability to score baskets, but generate scores by creating turnovers and giving his teammates the ball. By Offensive Win Shares, a stat that estimates how many total wins a player contributes on offense, only Banks has been more valuable than Alvarado for the Jackets, and Alvarado leads the team by a considerable margin in Points Produced, courtesy of sports-reference.com. But Alvarado has had to shoulder the scoring load in a manner unlike any player at Tech in the past decade. Josh Pastner’s offensive system values unselfish play, where any player registers as a scoring threat on a play, and there is rarely a “go-to” guy. This system worked well last season when the Jackets had substantial scoring threats with Josh Okogie, Ben Lammers and Tadric Jackson on the floor, but with all three players gone this season, the scoring burden has fallen to Alvarado and Banks almost exclusively. Whereas the Jackets had four players averaging ten-plus points per game last season, this season, only Banks and Alvarado have reached the threshold. Tech ranks dead last in the ACC in points per game in conference play. To be sure, Pastnerball values defense to a extraordinarily high degree, and the Jackets have delivered thus far on that promise — Tech ranks No. 12 in the country in field goal percent allowed — but Tech is faltering rapidly in the ACC because they have been unable to score without Alvarado on the court. Even worse, Tech has begun to struggle with Alvarado as well; after Alvarado notched 17 points on Virginia Tech in the first half of the Jackets’ meeting with the Hokies this January, Virginia Tech posted taller players on Alvarado and effectively shut him down for the second half as the Jackets lost, 52-49. And during Tech’s road game against Clemson, the Tigers used the same height mismatch to their advantage and held Alvarado to just 10 points in 35 minutes. Alvarado is a great scorer, but he is still much smaller than an average point guard, and he struggles against taller forwards and centers. That one of Tech’s two only dominant offensive weapons can be shut down the way Alvarado has been by Virginia Tech and Clemson means that Tech still has a substantial issue to address, even when Alvarado is healthy: they need more offensive threats to complement him. The offense cannot be Alvarado or bust. More offensive threats on the floor means less pressure on Alvarado and an easier way to punish teams going for the height advantage over Alvarado. It means less pressure on the team, overall, and a higher rate of offense. Tech can ruin teams’ efficiency like almost no other in college basketball, but Tech must begin capitalizing off of the forced misses and get buckets of their own. Where are the Jackets to find these threats? Perhaps Pastner should re-evaluate who is getting minutes. Forward Evan Cole has averaged just 13 minutes per game, but Cole’s field goal percentage is the No. 3 on the team behind Banks and Abdoulaye Gueye. Despite this, Cole has largely been relegated to the bench following some early-season injuries, losing out on his chance to join Pastner’s main rotation after missing a good portion of non-conference play. Cole represents a threat in both the front and backcourt, and at six-foot-nine, his imposing presence would punish a team going for a mismatch on Alvarado. Brandon Alston has also found himself in a small role but represents an efficient sharpshooting option, serving as Tech’s best three-point shooter this season — perhaps a few more minutes per game could help Tech’s offense while giving the oft-taxed Alvarado a breather, which could in turn make him much more effective down the stretch. Tech has defense in spades. There’s no questioning that, but holding ACC teams to season-worst totals in offensive efficiency ratings means nothing when Tech is still a worse-scoring team than their opponents. Behind Alvarado’s 16 points on Tuesday, Tech knocked off a depleted Notre Dame squad Tuesday, 63-61, as Tech had four scorers reach double digits. A more balanced approach to offense takes the pressure off Alvarado while keeping him as a threat, and it may be Tech’s best option.